The Forehand of many Tennis players is not as good as it could be because the non hitting hand doesn’t work with the stroke. In many cases the non hitting hand moves off in the opposite direction or hangs limply at the waist. When in the ready position your non hitting hand should be holding the racquet on or near the throat. As the ball approaches your non hitting hand helps to push the racquet back to the Forehand side and turn the shoulders at the same time so that you are ready to hit the ball before it bounces. 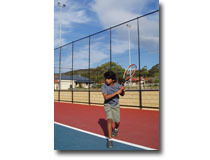 When you are in position the hands separate as the racquet moves forward towards the ball. To assist with your Racquet follow through your non hitting hand will move from just in front on the forehand side to the opposite side of your body either palm down at your waist or higher up so that you can catch your racquet at the end of the follow through. The first option will make sure that the hand doesn’t intefere with the racquet swing and the second will ensure that you follow through with enough acceleration to cross over from one side of the body to the other. Try both options to see if you have a preference. I hope this coaching tip will help you improve your forehand so that it becomes a weapon during your tennis matches.